Sing is a master of Shaolin kung fu, whose goal in life is to promote the spiritual and practical benefits of the art to modern society. He experiments with various methods, but none bear positive results. He then meets Golden Foot Fung, a legendary Hong Kong soccer star in his day, who is now walking with a limp, following the betrayal of a former teammate Hung, now a rich businessman. Sing meets Mui (Zhao Wei), a baker with severe acne who uses Tai chi to bake mantou, and even takes her to look at very expensive dresses at a high-end department store after hours. She soon forms an attachment to Sing and even gets a makeover in an attempt to impress Sing. However, this backfires and when Mui reveals her feelings to him, he tells her he only wants to be her friend. This revelation, coupled with the constant bullying from her overbearing boss, leads Mui to disappear. Team Shaolin enters the open cup competition in Hong Kong, where they chalk up successive and often ridiculous one-sided victories. They end up meeting Team Evil in the final, owned by none other than Hung. Team Evil had been injected with an American drug, granting them superhuman strength and speed, making them practically invincible, and they bring Team Shaolin back to reality when Team Evil's amazing capabilities prove more than a match for them. After Team Evil takes out Team Shaolin's goalkeepers, Mui, who has shaved her hair and improved her face, reappears to keep goal for Team Shaolin. In their final attack, Team Evil's striker leaps into the sky and kick the ball with enormous force towards Mui; she uses her martial art to divert and stop it, thus preventing a goal. Mui and Sing combine their martial skills and rocket the ball downfield. The ball plows through Team Evil's goal post, thereby scoring the winning goal. Sing is then thrown into the air in celebration as the trophy is presented to him and his team. 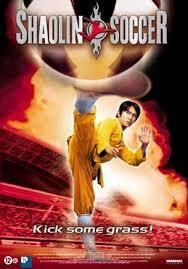 Shaolin Soccer (2001) Sing is a master of Shaolin kung fu, whose goal in life is to promote the spiritual and practical benefits of the art to modern society. He experiments with various methods, but none bear positive results. He then meets Golden Foot Fung, a legendary Hong Kong soccer star in his day, who is now walking with a limp, following the betrayal of a former teammate Hung, now a rich businessman. Sing explains his desires to Fung who offers his services to coach Sing in soccer. Sing is compelled by the idea of promoting kung fu through soccer and agrees to enlist his former Shaolin brothers to form a team under Fung's management. Sing and Fung attempt to put together an unbeatable soccer team. Fung invites a vicious team to play against them and the thugs proceed to give the Shaolin team a brutal beating. When all seems lost, the Shaolin disciples reawaken and utilise their special powers, dismantling the other team's rough play easily. The thugs then give up and ask to join Sing team Sing meets Mui (Zhao Wei), a baker with severe acne who uses Tai chi to bake mantou, and even takes her to look at very expensive dresses at a high-end department store after hours. She soon forms an attachment to Sing and even gets a makeover in an attempt to impress Sing. However, this backfires and when Mui reveals her feelings to him, he tells her he only wants to be her friend. This revelation, coupled with the constant bullying from her overbearing boss, leads Mui to disappear. Team Shaolin enters the open cup competition in Hong Kong, where they chalk up successive and often ridiculous one-sided victories. They end up meeting Team Evil in the final, owned by none other than Hung. Team Evil had been injected with an American drug, granting them superhuman strength and speed, making them practically invincible, and they bring Team Shaolin back to reality when Team Evil's amazing capabilities prove more than a match for them. After Team Evil takes out Team Shaolin's goalkeepers, Mui, who has shaved her hair and improved her face, reappears to keep goal for Team Shaolin. In their final attack, Team Evil's striker leaps into the sky and kick the ball with enormous force towards Mui; she uses her martial art to divert and stop it, thus preventing a goal. Mui and Sing combine their martial skills and rocket the ball downfield. The ball plows through Team Evil's goal post, thereby scoring the winning goal. Sing is then thrown into the air in celebration as the trophy is presented to him and his team. A newspaper article then shows Hung being stripped of his title of soccer chairman and sent to jail for five years, while Team Evil players are permanently banned from playing soccer professionally. Sing goes out for a morning walk and feels happy to see people practicing Kung Fu. The camera pans to the poster of Sing and Mui who have married and become famous.